For Current On the Way Issue Click HERE. Thank you for visiting the Barnabas Institute-Center for Christian Community website. Santa Fe, NM and New Mexico. To receive our monthly eNewsletter and updates, please sign up. Our current newsletter can be seen by clicking the link above. Our Lady of Guadalupe Catholic Church (417 Agua Fria Street at S. Guadalupe) will present a live portrayal of Jesus’ trial and crucifixion. The Live Stations of the Cross will be presented onGood Friday, April 19 at 3:00 p.m. The enactment is a special gift to Santa Fe from Our Lady of Guadalupe. The Passion portrayal will be presented in Spanish. For more information call (505) 983-8868. Nuestra Señora de Guadalupe Catholic Church (417 Agua Fria Calle Guadalupe S.) presentará un vivo retrato del juicio y crucifixión de Jesús Cristo. Las Estaciones de la Cruz se presentará viernes, 19 de april a las 3:00 p.m. La representación de la Pasión se presentará en español. Para más información llame al (505) 983-8868. Many special services occur during Holy Week at churches’ usual times. The services listed below occur at other than the usual service times, or on days when services are not usually scheduled. Also, as you know, the Orthodox churches uses the Julian calendar, different from that of the Western Christian churches. They are listed separately below. 8:00 a.m. Mass in Spanish; 10:00 a.m. Mass; 12:00 noon (or before, if procession from Plaza arrives earlier) Pontifical Mass; 5:15 p.m. Mass. Note: At 10:45 a.m., gather at the Stations of the Cross Garden to begin the citywide ecumenical Procession to the Plaza for Blessing of the Palms and procession back to the Cathedral Basilica. 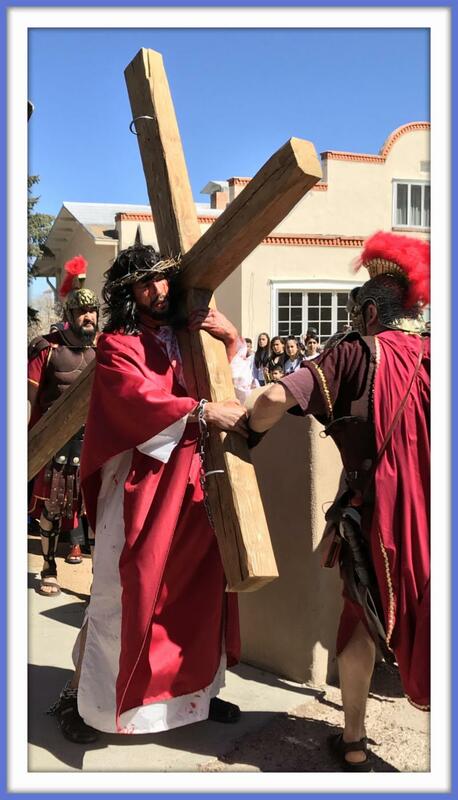 7:30 a.m.; 9:30 a.m.; 12:00 noon (Bilingual);5:30 p.m.
Holy Trinity Orthodox Church, Liturgy 9:00 a.m.; 6:00 p.m.
Santuario de Chimayo will welcome 3,000 pilgrims during Holy Week 2019. Persons seeking spiritual renewal and healing will visit the Santuario between April 14-20. 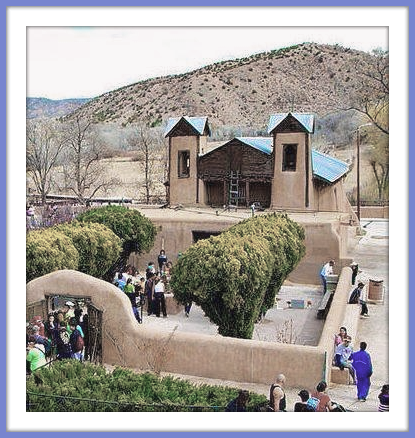 Santuario de Chimayo was constructed by the Abetya family as a family chapel in 1816. It has been a source of spiritual and physical healing since before its construction. Those who make pilgrimages to Chimayo experience a blessing as a result of their journey. Please check the Barnabas Institute website for church sponsored Pilgrimages.